What is it to be human? And what kinds of decisions do humans make better than ALGORITHMS? Algorithms can learn, apply complicated frameworks and sift through vast amounts of data. But what about complex situations where there is no obvious precedent or apparent logic for finding the answer? Can an algorithm make decisions that inspire, resolve moral conundrums and create a new future? And can it decide on a path forward that fills people with a sense of optimism for the future and commitment in the present? No, they can’t. But humans can. In fact, this is the essence - and best - of humanity. As we navigate our complex world, we constantly face double binds, conundrums and challenges. When we inject nobility, grace and compassion into our decisions, it makes all the difference. 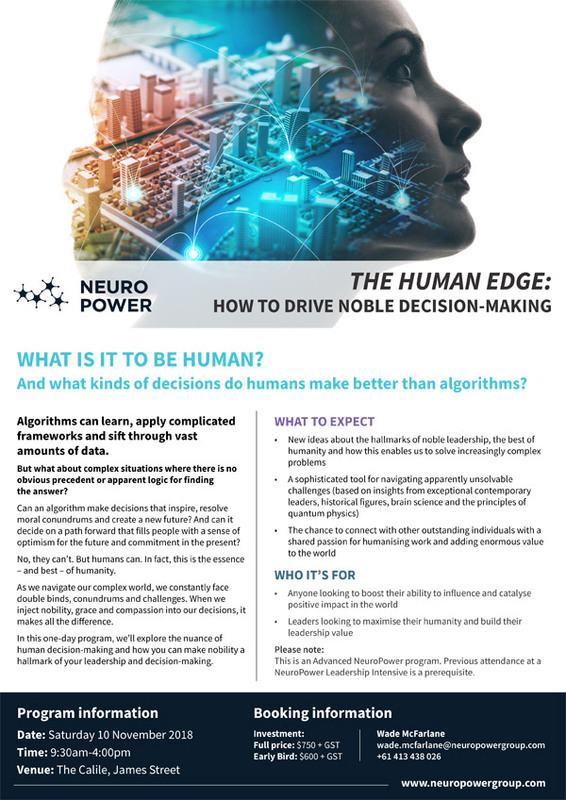 In this one-day program, we’ll explore the nuance of human decision-making and how you can make nobility a hallmark of your leadership and decision-making. This is an Advanced NeuroPower program. Previous attendance at a NeuroPower Leadership Intensive is a prerequisite. Peter Burow authored the ground breaking NeuroPower framework, a system which explains human behaviour through the integration of neuroscience, psychology and best practice management theory. Peter is also the author of numerous books, Executive Chairman of the NeuroPower Group and a Partner of a number of consulting firms that specialise in applying neuroscience, performance psychology and cultural analysis to the challenges facing leadership teams at all levels of an organisation. Morning tea, lunch and afternoon tea will be catered. If you have special dietary requirements please advise us ASAP so we can cater accordingly.